Ahh, Twitter. So many have a love/hate relationship with this platform. On one hand, it allows marketers to reach a large audience with short bursts of information. Some business owners, however, feel like the character limit restricts their message. Whatever your feelings about this form of social media, there are still Twitter mistakes you should avoid at all costs. With the average tweet having a lifespan of about 18 minutes, you want to leverage that time to your advantage. 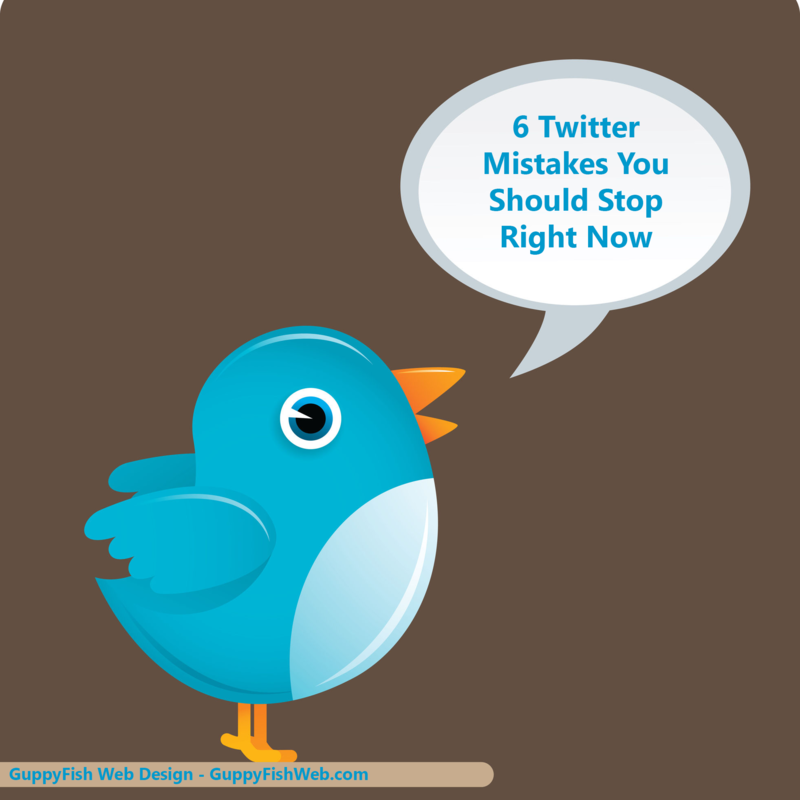 Avoiding these common Twitter mistakes can make your campaigns more successful. While the occasional spelling or grammar mistake can be amusing, nothing says “unprofessional” more than careless errors sent out to thousands (or even millions) of followers. Nothing says “unprofessional” more than careless errors sent to thousands of followers. In fact, some pretty major brands have made mistakes on Twitter. Be better than that. A little proofreading goes a long way. The Twitter audience varies greatly from the Facebook one. People on Twitter look for short bursts of information. With that in mind, they don’t want to click a link just to read the rest of your post. When a user posts to Facebook and has it automatically copied to Twitter, only part of the post comes across. In order for a user to see the rest of it, he or she must click the link. Trust me, people in the Twittersphere are not going to click a link just to read the rest of your status. The only links they will click lead to useful articles or information they find relevant. That doesn’t mean you can’t have the same message on Facebook and Twitter. You absolutely can. Just don’t have your Facebook message automatically go to Twitter. You’ll lose a lot of followers that way. If you’re trying to save time on social media, there are other ways to do it. Do you like to follow people if you have no idea what they offer? Me neither. Nevertheless, I see all kinds of profiles with little or no information. When I receive a notification that someone has followed me, I check out that profile to see if it’s worth a follow back. This is easiest (on an actual computer) by mousing over the person’s profile pic. If the Twitter profile is empty, I’m not following back. It’s that simple. If the Twitter profile is empty, I’m not following back. Why do I want to follow you if I don’t know what your content is about? At least take the time to write a few sentences about who you are and what you offer. Huge missed opportunity! I mean… HUUUUUUGE! I get the hashtag thing. You want people to find your information based on a variety of topic searches. There can, however, be too much of a good thing. Believe it or not, tweets with too many hashtags actually see a decline in engagement rates. Even Twitter itself recommends that the optimal number of hashtags is two. If more than half your tweet consists of hashtags, you’re doing it wrong. On the other hand, using zero hashtags has its own set of disadvantages. When users search for tweets about a particular topic, the hashtags point them to the best content. If you can pick two that generally describe your tweet’s content, you’ve done the job! For example, if I were to tweet about this article, I’d probably use #socialmedia and #marketing as the related hashtags. Nobody in your professional world wants to hear about your recent breakup or health problems. Seriously, they don’t. So save your news about explosive diarrhea for your personal account. (Better yet, save it in general.) There’s a reason that most CEOs have separate Twitter accounts for their personal stuff. Follow their example… please? So there you have it: a roundup of my least favorite Twitter mistakes. The best rule of thumb on Twitter? Be professional. Use hashtags wisely and sparingly. Don’t annoy people. So grow your Twitter presence, and keep swimming along!